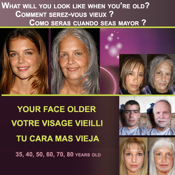 A professional application which allows you to discover how you will look at age 40, 45, 50, 60, 70 or even 80 years old. With this application you are able to see clearly/instantly how your skin, wrinkles, even your hair will age over time. Just upload a photo of yourself (or someone you know) and according to our unique/proprietary professional treatment, you’ll get a picture of that person at the age desired. You can then keep this picture on your iPhone and share it with your friends.